Dynari Amnis is an Imperial archer who owns a home in the Talos Plaza District of the Imperial City. She is a member of the Thieves Guild and her house is used as a temporary headquarters by the Guild during Hieronymus Lex's raid on the waterfront. On a typical day, Dynari Amnis goes to bed at 6am and sleeps until the clock strikes noon, then gets out of bed for a late breakfast on the ground floor. At 2pm, she visits the Imperial Market District, wandering aimlessly and talking to citizens for three hours. She also takes her armor off for the period of time. On weekdays, she visits The Foaming Flask at 5pm for drinks and leaves at 11pm. On weekends, she is bound to wander the Imperial City Arboretum all day long, from when she leaves at 2pm until she returns home at midnight. During the Misdirection quest, she remains in her house, helping Methredhel keep the guild together. 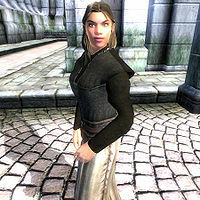 Dynari was intended to play a role in the unfinished "Imperial Couriers" quest; at midday on the 17th of each month, as long as Witseidutsei is still alive, she will head to the Black Horse Courier office in the Market District and spend a brief amount of time there, before resuming her usual rotuine. She wears a dark shirt, light brown linens, and quilted shoes but will change into a set of leather armor comprising boots, cuirass, and greaves when necessary. She also carries a steel bow with seven arrows, a steel dagger, and her key. When you meet her for the first time, she will greet you: "Health and fortune, traveler. I'm Dynari Amnis. May the Nine bless your dreams." Upon asking her about the Imperial City, she responds by saying "It's the city of Tiber Septim, youngest of the gods. Go to the Palace and the Temple of the One. Stand on the stones where Talos stood." During Misdirection, when the Waterfront District is under martial law, the beggars of the Imperial City will tell you about Methredhel’s hideout: "She's hiding in Dynari Amnis' house in the Talos Plaza district. She's one of the few that escaped when Lex invaded the Waterfront." When you enter the house, you will find both of them on the ground floor; when Dynari sees you, she will choose between three different lines, all of them concerning Lex and the master plan: "The plan should work, with the Shadow's blessing. ", "We need more pressure on Lex. He's a stubborn fetcher." or "I have word that two of the jobs were successful." If you talk to her, she will just point you towards her unexpected resident: "I'm busy now. You need to talk to Methredhel." Esta página foi modificada pela última vez à(s) 04h06min de 26 de abril de 2013.